One of the most successful homegrown hospitality groups in the Middle East, Emaar Hospitality Group will provide authentic experiences with a strong local flavour at various locations across the Expo 2020 site, including VIP clubs and lounges, as well as in its hotels and restaurants in Dubai. As the Official Hotel and Hospitality Partner, Emaar Hospitality Group will be responsible for providing exceptional service to Expo 2020’s special ticket holders. The Group will also operate a number of other experiences across the Expo site. In addition, Emaar Hospitality Group will showcase trends and innovations in the hospitality industry. Rolando Martins, Chief Visitor Experience Officer, Expo 2020 Dubai, welcomed the partnership as a key element in providing millions of visitors to the Expo with an exceptional experience, as well as an opportunity to leave a lasting legacy for UAE tourism. He said: “The hospitality experience at Expo 2020 is an opportunity to showcase this important aspect of the Emirati identity and culture. Emaar Hospitality Group has a record of warmly welcoming millions of visitors to Dubai every year – many of whom return again and again, which makes them the ideal hospitality partner. Olivier Harnisch, Chief Executive Officer of Emaar Hospitality Group, said: “Emaar Hospitality Group has paved the way for creating an innovative hospitality landscape in Dubai, offering a range of experiences, from luxury to contemporary midscale. I am delighted that we have been awarded Expo 2020 Dubai’s Official Hotel and Hospitality Partnership. My team worked hard towards this achievement and I thank them for their commitment and dedication. Emaar Hospitality Group owns and manages a portfolio of hospitality assets and brands that includes Address Hotels + Resorts, Vida Hotels and Resorts and Rove Hotels. The group, which was established in 2007 as a subsidiary of Emaar Properties, also operates a number of serviced residences, golf retreats, a yacht club, a polo and equestrian club, and restaurants. Emaar Hospitality Group’s personal, innovative and memorable experiences have helped guide Dubai’s fast-growing tourism landscape. 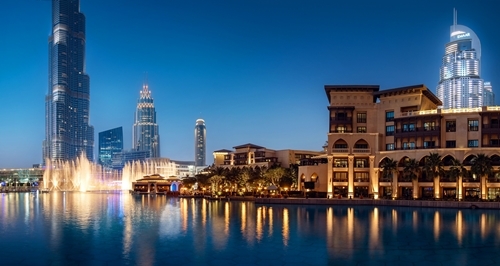 Dubai’s Tourism Vision 2020 has set a goal to welcome 20 million visitors annually by 2020. In 2017, Dubai welcomed 15.79 million visitors, an increase of 6.2 per cent compared to the previous year. Expo 2020 Dubai expects to welcome 25 million visits during the six months of the event, from 20 October 2020 to 10 April 2021. About 70 per cent of visitors are projected to come from outside the UAE – the highest international proportion in the 167-year history of World Expos.